You are here: Home / Blog / Benefits vs. Features? NO! It’s been said by many prominent and successful marketers that marketing content should talk about benefits rather than features. I see that as valid, if you’re addressing an audience that’s still in the early stages of a buying cycle. At that point, they may be undecided about whether or not what you’re peddling is worth the cost, effort or risk. If they’re beyond the point of being simply intrigued, though, they’ll most often transition into a comparison mode, looking also at your offering’s price and features against their other options. This is the point in the cycle at which many marketers will shift their content’s focus from benefits to features. 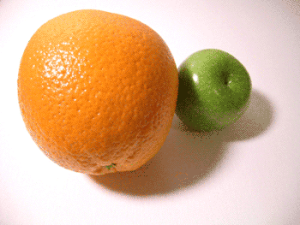 If all the other options are presented the same way, then the customer will be comparing apples and apples. But let’s think a moment about the process the user is going through. Somehow, their initial attention is captured and they view a page – maybe yours, maybe a competitor’s. They’re intrigued enough to absorb some of the information, and hopefully, their interest grows sufficiently that they do some comparison shopping. If we assume that their first exposure is focused on benefits and that the benefits of all the competitive offerings are similar, then it’s logical to think that most will begin looking at the features of each option. Having made that transition, they’ll probably look specifically for features of each option, so if you’re presenting only benefits, you may fall out of the competition. A no-brainer, right? The same may be true for those options that only talk about features, but by this point in the cycle, the customer will have probably already accepted that there are benefits to be realized. So these options will normally only lose the opportunity to capture the interest of new customers at their first exposure. They’ll still be in the running for the comparison cycle. So addressing only features can limit your success. Another no-brainer. On the other side of the coin, some users are savvy enough to already recognize the potential benefits, so failing to explain your product’s features may also knock you out of the running. Too often, I see pages that been crafted around benefits or features, but not both. Or if both are addressed, it’s on separate pages. That’s better than lacking one or the other, but it fails to simplify the customer’s journey, so it could still result in lost opportunities. Doesn’t it make more sense to display both benefits and features on the same landing page? This creates a better user experience, allows you to rank the page for both benefits and features and prevents you from being booted out of the pool because your page doesn’t offer what the user’s looking for. It also presents your information in a manner that’s going to have a positive subconscious effect on your users (easier is always better in marketing). I recommend listing both benefits and features on your landing pages – go after ranking for both benefits of… and features of… you’ll get more out of it. And always think through the user’s cycle – it can often reveal opportunities to leave your competition behind. Wholeheartedly agree with you here on this Doc. The retail salesman in me would also include the Advantages to speaking on Features and Benefits. The features may distinguish, the advantages prove value, and the benefits support the value. One last element in my sales experience is the Grabber, or why buy now or why buy from me when they have the same thing on another site. Free shipping, discounted add-ons, or instant rebates are all forms of the “Grabber”. Hi, Don – long time no see. Yeah, I rolled the advantages and benefits together here, but if you’re going into a head-on competition (especially when a customer is pressing for why yours over the other guy’s), breaking the advantages out is definitely a good idea.